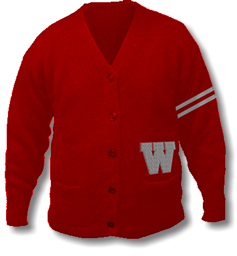 Varsity Athletic continues the time-honored heritage of boatneck styled pullover varsity letter sweaters, and button-down cardigan letter sweaters. 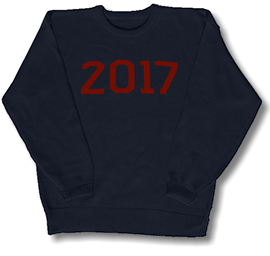 School letters are available in intarsia (knitted into), or sewn onto the sweater. Shoulder striping is available as an option for both the cardigan and pullover sweaters. Minimum quantities of 24-48 pcs. per design. 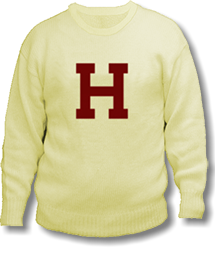 Crewneck Style Wool Sweater with Intarsia (knitted in) "H"
with Intarsia (knitted in) "2017"
The Tradition continues... We are the nations largest collegiate varsity award supplier of these heirloom items that were popular in the letter sweaters heyday of the 1950's. Our sweaters have a “soft-hand” and are made to exacting specifications. The school letters are an integral part of the sweater and they can either be knitted into, or sewn onto the sweater. The attention to quality and craftsmanship is reminiscent of days long gone--just like the ones in granddad's closet. But after all, that’s what tradition is all about!